What Are Ohm's and Why Should I Care? Many people researching car subwoofers and speakers (drivers for our purposes here) wonder what an Ohm is and what it has to do with their driver. The answer is that a driver's Impedance, measured in Ohms often represented by the Greek letter Ω, has a lot to do with how the driver will interact with an amplifier and overall system's performance. A German physicist named Georg Ohm is best known for his research into the behavior of electrical circuits, particularly the relationship between voltage, current, and impedance (often labeled as resistance) and power, which today is commonly referred to as Ohm's law. 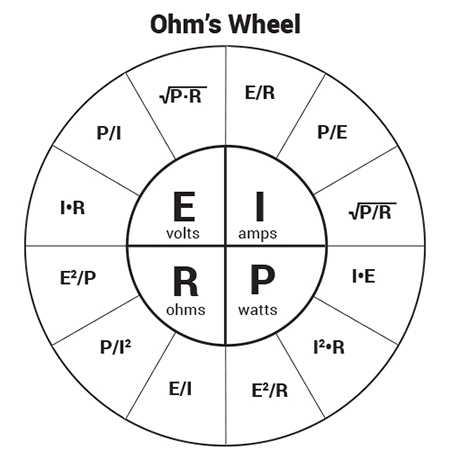 This relationship, as depicted in the Ohm's wheel graphic, is fundamental in car audio since a car audio amplifier outputs voltage and a driver's voice coil has a fixed impedance, which enables the watt level created to be calculated. Car audio subwoofers and speakers usually have either a single voice coil that is rated at 8Ω, 4Ω, or 2Ω or dual voice coils that are rated at 4Ω or 2Ω. For more information on this topic, read the MTX library article found here. Understanding the driver's impedance enables the user to select an amplifier that matches to achieve optimum performance. Drivers that have one voice coil are easy to deal with, as there is a single impedance option. If a driver is rated at 50-watts RMS power and has a 4Ω impedance it is important to find an amplifier whose specifications closely match those of the driver, say between 40-60 watts RMS at 4Ω. Making sure both the driver's and amplifier's specifications are measured in RMS power is very important to the longevity of both the driver and amplifier in the system; measurements like peak power and max power are often theoretical and shouldn't be used as they may lead to damaged equipment. For more informaton about RMS vs. Peak power ratings, see the article found here. If more than one driver with a single voice coil is being used in a system, the two speakers will have to be connected together either in series or in parallel as to present a combined resistance to the amplifier. See the MTX article found here for more information on wiring multiple speakers to an amplifier. If a user wanted to connect two of the same drivers found in the previous example to a single channel on an amplifier, they would have to be wired at 2Ω or 8Ω depending on the series/parallel option. Both of these change the voltage output of the amplifier and therefore the eventual wattage created. Wired at 2Ω, the user would want an amplifier that is rated at 100-watts per channel at 2Ω. If they were wired to 8Ω, the amplifier would only put out enough voltage to generate 25-watts per channel which would not be enough to power both speakers effectively. Drivers with dual voice coils present a greater challenge but also more flexibility in designing a system. Since each driver has two voice coils the user must choose whether to wire them in series or parallel to maximize the output voltage of the amplifier to ensure the proper wattage is created to power the driver. Nevertheless the same principle applies as discussed in the previous paragraph. Paying attention to the RMS rating of the driver and amplifier will provide the guidance necessary to choose the right amplifier to connect to the driver or vice versa. With this basic understanding of Ohm's and their importance to an audio system, Ohm's law can be used to properly set the amplifier to generate the desired amount of watts. Earlier we stated that an amplifier should be rated between 40-60 watts RMS to power a 4Ω driver rated at 50-watts RMS. Someone might look at that and say if the amplifier can output enough voltage to generate 60-watts based on a 4Ω impedance, won't that damage the driver? The fact is yes it could, but the more important point is that it doesn't have to output the full voltage level it is capable of outputting. Every amplifier has a gain adjustment on its control panel. This gain is not a volume control; it is a means to control the output voltage of the amplifier. Using Ohm's law, which tells us that volts are equal to the square root of power multiplied by impedance. If the driver is rated at 50-watts and the resistance is 4Ω, then volts equals the square root of 200 or 14.14 volts. Using a multi-meter tool set to the impedance measurement connected to the amplifier's output during installation, a user can precisely set the amplifier's gain to regulate the proper voltage output to maximize the amplifier and driver's performance. Check out this YouTube video to see Ohm's law and gain adjustment in action. As is clear Ohm ratings are critical to the performance of any car audio system. Understanding their relationship to an amplifier makes finding the right subwoofers or speakers and amplifier an easy process that will result in a great sound system that will last for many miles.